Celebrate what’s possible as five Disney heroines spark the courage inside us all in Disney On Ice presents Dare To Dream! 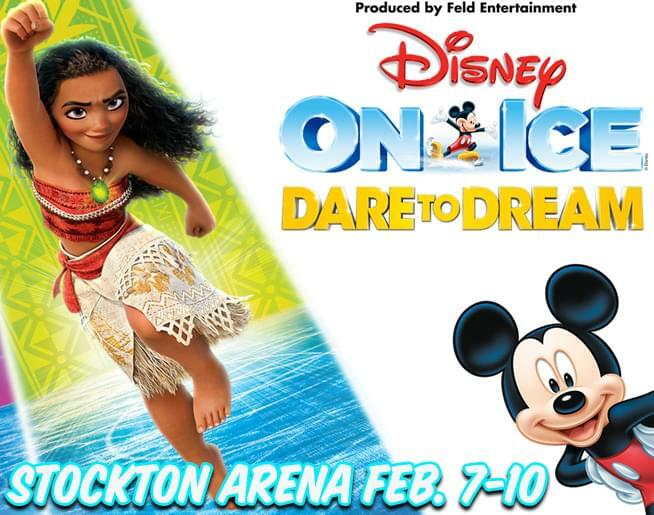 In her Disney On Ice debut, see how far Moana will go in an epic adventure with demigod, Maui, to save her island and discover her true identity. Join Belle as she fearlessly befriends the enchanted castle staff and reveals the Beast’s gentleness. Experience Anna’s devotion to her sister, Elsa, on her life-changing journey to stop an eternal winter. Explore with Rapunzel, Flynn Ryder, Cinderella and friends from around the Disney Kingdom as they find the heart and determination to overcome obstacles and make their dreams come true. Journey with Mickey and Minnie to uncover why no goal is too big when we find the strength to shape our own destiny at Disney On Ice presents Dare To Dream! Feb. 7-10 at Stockton Arena! Keep it on KHOP to win your tickets!